I wrote last week about speaking with candor in our work place (or at church), but with a large dose of love and sensitivity. I do understand social graces and kindness. I’ve never told my Aunty Gloria that she talks too much and too loudly. Instead I avoided spending very much time with her. Of course we must temper our truth-speaking with love, positiveness and encouragement. But there remains virtue in truthfulness — in both the business world and the church. Secondly, it’ll generate more discussion and new ideas. When one person says out loud what everyone else on staff is thinking, “This system is a waste of time and money”, then others will jump in and come up with alternatives. Stroking the boss’ ego will ultimately keep the company from success. Thirdly, honesty unclutters discussion and feedback. It speeds up progress. It generates profits (if that’s one of your business values). 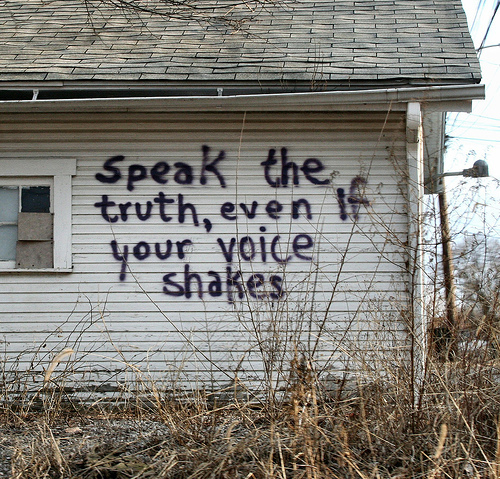 We all agree that truth speaking flies in the face of human socializing. It’s difficult. But so is getting up at 5:30 and doing calisthenics. The fact remains, honesty is the best policy. God is very truthful. He speaks with candor. We can only build our lives on a solid foundation of truth. How would I like it if my doctor didn’t tell me that I had a serious disease because he didn’t want to hurt my feelings. As the Apostle Paul wrote: So stop telling lies. Let us tell our neighbours the truth, for we are all parts of the same body.